Rent The Sequoia Retreat Center | Corporate Events | Wedding Locations, Event Spaces and Party Venues. The Sequoia Retreat Center is a place where the deepest meaning of life may be explored in an atmosphere of quiet and beauty. Extend your wedding magic into a weekend-long celebration in the coastal redwoods. Rehearsal-Welcome Dinner: Let us help you plan your Welcome Dinner and enjoy a relaxed barbecue. 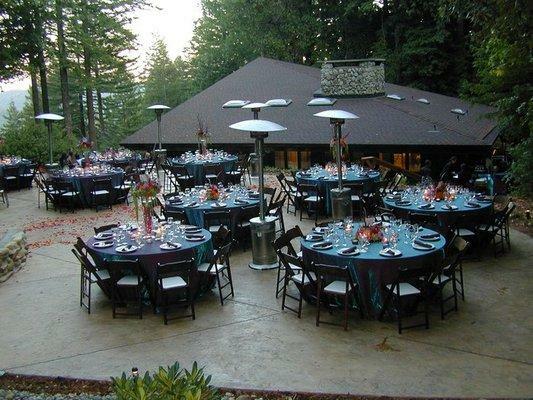 Ceremony: At Pixie's Garden Patio with sweeping views or nestled in The Amphitheater surrounded by Redwoods. Reception: At Las Alas Lodge and outdoor dining at Pixie's Garden. Farewell Wedding Brunch: Before departing for your honeymoon, join your guests for a Wedding Brunch at The Lodge. Peace Park: Large lawn area for volleyball, picnics or just relaxing. Madrone Circle and Labyrinth: Just below Las Alas Lodge. Perfect for a night time fire. 13 Cabins: Each cabin sleeps from 1 to 5 persons with a capacity of 55 overnight guests. Each cabin has a private full bathroom and heater. Bedding, shampoo, soap and linens are provided.